The tools-light VIB is a special one and different from all other VIB files that include e.g. ESXi drivers. What makes it special is the fact that it is not installed into the ESXi /bootbank partition but into its own system partition which is mounted as /store, but is better known as /locker (which is by default just a symbolic link to /store). 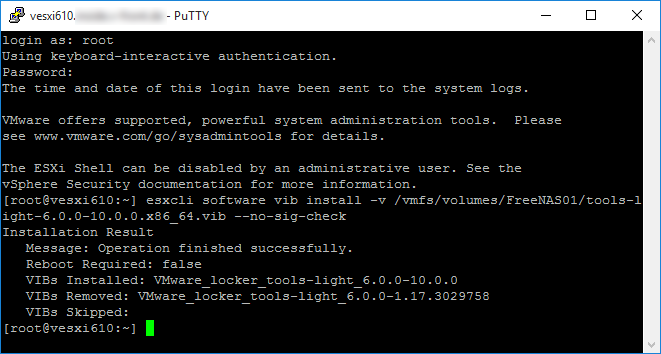 Yesterday I published an updated version of my ESXi Community Packaging Tools, and they allow to create a tools-light VIB of type locker. Here is a detailed walk-through, all you need to get started is a Windows machine. 1. 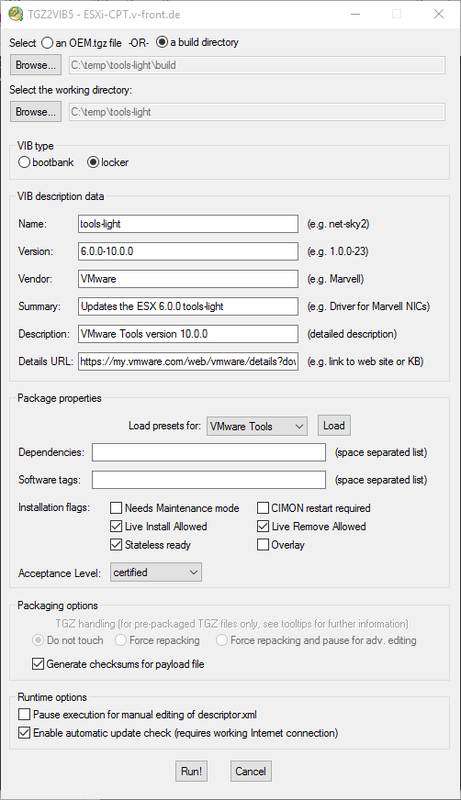 Download the ESXi Community Packaging Tools. They come as a self-extracting archive - unpack it to wherever you like. 2. Download the VMware Tools version 10.0 (MyVMware login required). You need at least the first ZIP file titled "VMware Tools packages for Windows, Linux, FreeBSD and OS X". If you have Windows 2000 and/or Netware VMs in your environment and want to install VMware Tools on them then you also need the second ZIP file titled "Legacy VMware Tools packages for Windows and Netware OS". 3. Create a new empty directory on your machine and call it tools-light. In the following instructions I will use C:\temp\tools-light as an example. In this directory create another sub directory build and under build create yet another directory named 6.0.0. 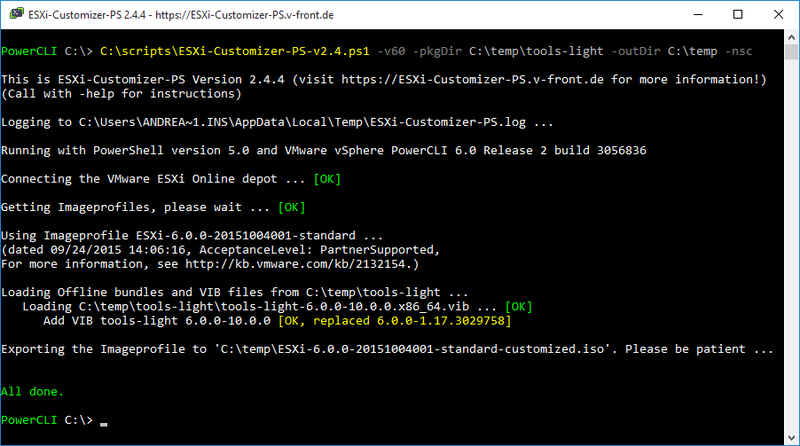 Please note: If you want to create the package for another version of ESXi then name the last directory 5.5.0, 5.1.0 or 5.0.0 respectively. You will be able to use the package for this ESXi version only. In the following instructions I will stick with 6.0.0. At the top of the GUI select (x) a build directory and browse for C:\temp\tools-light\build. For the working directory pick C:\temp\tools-light. 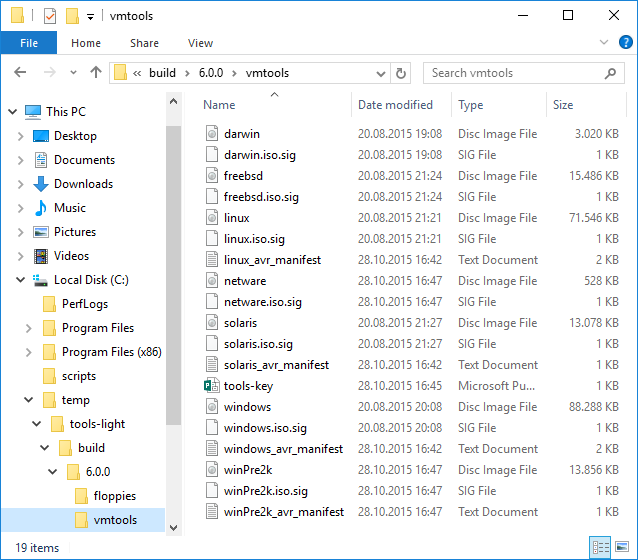 You can find the VIB file tools-light-6.0.0-10.0.0.x86_x64.vib in the working directory. In the following steps I will show you how to update your ESXi host with it. 6. Use the Datastore browser in the vSphere Client to upload the VIB file to a datastore that is accessible by your host. In this example I use a datastore called FreeNAS01. Note: This is one line wrapped for readability. Replace FreeNAS01 with the name of the datastore that you are using. The switch --no-sig-check is necessary, because our custom VIB file does not have a valid electronic signature. Important: Use the full path name starting with / for the VIB file, relative path names will not work! You have now updated the embedded VMware Tools to version 10.0 on your host! You can immediately use them for installing/updating the VMs running on this host. A reboot is not required. 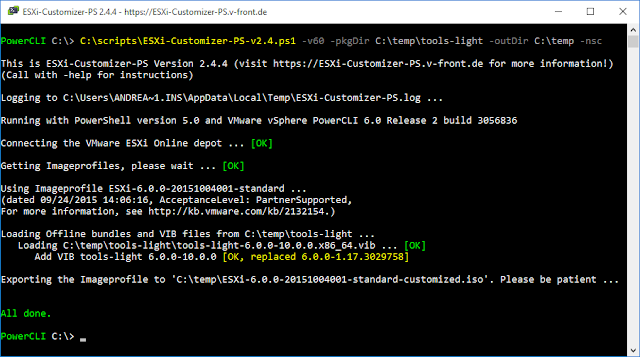 Using my ESXi-Customizer-PS script you can also build a customized ESXi installation image that already includes the tools-light VIB version 10.0. Congratulations! You have just built an ESXi 6.0 installation image with the latest ESXi patch level(!) and the VMware Tools version 10.0 embedded. Unfortunately you will not be able to install your custom VIB file through VMware Update Manager (VUM) because of the missing electronic signature. And - if this has not become clear by now -: Of course this whole procedure is completely unsupported by VMware! You have been warned ..., but - on the other hand - all we do here is replace the VMware Tools files with updated copies that were provided and are supported by VMware. So I consider this pretty safe. great post Andreas!! I will be doing this in my environment soon! Might do a video of it for you...stay tuned! Thanks, Alex. I haven't dared to ask ..., but this would be awesome! whenever you do decide to update and release a new version, please don't forget to to consider the ideas I sent you via email which you agreed with for the next release. Can't wait until that is available!! Oops, I was using an "internal beta build" :-) for the screenshots ... Of course that will also work with the currently released version 2.4.3. And no worries, I will take your suggestions into account for the next public release. We had issues with sysprep in combination with VMware Tools 10.0. Keep that in mind before upgrading your templates. I followed this tutorial. Everything went fine. But now after the esxi is installed i tried to install vmware tools on VM and the iso files are nowhere to be found. Call "VirtualMachine.MountToolsInstaller" for object "busybox" on ESXi "esxi.imperia.lan" failed. Unable to install VMware Tools. An error occurred while trying to access image file "/usr/lib/vmware/isoimages/linux.iso" needed to install VMware Tools: 2 (No such file or directory). If your product shipped with the VMware Tools package, reinstall VMware ESX, then try again to install the VMware Tools package in the virtual machine. I have no idea right now. Have you updated an existing host with a new tools-light VIB, or have you installed a new host with a customized ISO that you added the tools-light VIB to? Is it really installed now? Please send me the results via e-mail to info(at)v-front.de. Thanks! 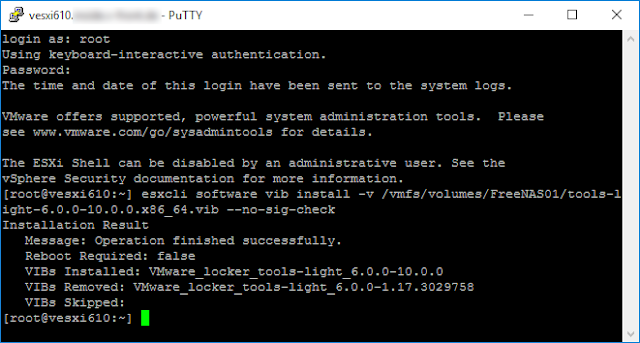 I solved the problem by manually copying the files from the previously downloaded VMware Tools v10.0 to the linked destination and adapting the privileges of the files and folders. Got same problem, issue was mistake in folder naming during VIB build process. I falsely named the folder "\tools-light\build\6.0\" instead of "\tools-light\build\6.0.0\"
maximum supported size is 239 MB. it looks like you did something wrong when creating the VIB package. It should be only about half the size (184 MB for me). Be sure to closely follow my instructions. Sorry for posting as Anonymous, i have no googgle acount!! Strange ... maybe there is a bug that doubles the required space counter, because your first try failed. Worked perfect! 5.5.0 U3b (VMware-Tools-10.1.15-core-6677369.zip). Auto-upgraded 3 hosts in no-time-flat. Performed a patch update thereafter and it did not overwrite the VIB.. skipped the VMtools VIB. Thank you!